Luke Davies on why the text-based mainstream has a lot to learn from the technically innovative performances at this year's London International Mime Festival. It’s unfortunate that the London International Mime Festival is called the London International Mime Festival. To people unfamiliar with it the name suggests white-face traditional mime – which could be why every January and February I find myself sitting in dark rooms alongside confused looking Hampstead couples who were hoping to cultivate their infants by weaning them on the next Marcel Marceau. But of course, the festival is far more wide-ranging and less orthodox than it sounds. It’s true that all of the work has in common an absence of spoken dialogue (as in, er, it’s mime). But this covers everything from circus to dance to puppetry to mask theatre – from shows made entirely out of industrial fans and carrier bags (Compagnie Non Nova’s 2015 L’Après Midi d’un Foehn) to Russian company Derevo’s surreal and hypnotic fusions of Dada and Japanese Butoh. In fact, I would say that some of the most original and impressive performances I have seen in London have been at the festival. Which is unsurprising, as it’s probably the biggest curated international theatre festival we have (one up from LIFT, which is traditionally on a slightly smaller scale, and is biennial). It’s a pity, then, that lots of people who support or work in theatre are either unaware of the festival or dismissive of it. I’m saying this as someone who works in theatre (not visual, but text based). I’ve had experiences with directors and actors who are otherwise pretty tuned in being baffled and even mildly offended by the suggestion that they should come with me to see a show at the mime festival (I’m assuming it’s the festival that’s the cause…). It’s indicative of a division between mainstream text-based and experimental visually-orientated theatre that refuses to go away. Something that’s surprising given that some of the most significant playwrights of the twentieth century – people like Yeats, Cocteau, Ionesco, Artaud and Beckett – had the express agenda of emphasising the visual aspects of theatre by using imagery to convey meaning, often in the process departing from spoken text completely. A lot of visual theatre – and these mime shows in particular – seem to me like the logical extension of that project. And as such it seems fair to argue that they should be an integral part of the London theatre scene – not, as it sometimes seems, a side show. I’m exaggerating if it sounds like I’m saying that the festival is little-known and overlooked: it still gets some broadsheet coverage and is occasionally mentioned on a BBC culture show. And of course there are publications (like this one) that cover it pretty comprehensively. But its appeal is still niche – and the truth is it’s not a recognised event in the theatrical calendar for most people operating within the mainstream. This to me seems like a real mystery. Surely this kind of work – with its different approaches to narrative and its uncovering of new formal possibilities – should be of interest to everyone? Certainly my experiences at the festival as someone primarily interested in text have left me feeling that this sort of work contains clues as to how the rest of us can evolve. One of the mime festival companies that have consistently amazed me has been Compagnie 111 – with their shows that combine movement with complex mechanical sets. Working alongside movement artists with backgrounds in ballet, flamenco and circus skills, C111’s lead artist Aurélien Bory has created a series of works that rest somewhere between dance and sculpture – highlights being his 2011 show Sans Objet (featuring a giant mechanical arm and two dancers) and his 2015 Plexus (a solo piece performed inside a giant cube containing five thousand vertical cords). The simplicity and inventiveness of these shows, together with their technical brilliance, is I think unmatched by anything I have seen from a conventional theatre company in this country or abroad. Another show that has stayed with me is Hiroaki Umeda’s 2012 multimedia performance Haptic + Holistic Strata. Umeda is a Tokyo-based performer, sound artist and lighting designer. His show Haptic was an brilliantly intelligent and sensitive incorporation of multimedia and movement, with Umeda effectively performing inside the projections he had created and interacting with the moving images. Like C111’s shows – Umeda incorporates technology into his work in ways that rewrite the rulebook, suggesting new possibilities for integrating performance and visual media. Of course we’re used to multimedia in theatre shows – but nothing as sophisticated or as complex as this. It isn’t just technical innovation that distinguishes these shows. It’s also the general level of resourcefulness and daring that separates it from the mainstream. Last year, for instance, there were at least three remarkably original concept-driven shows: to begin with New York-based puppeteer Basil Twist’s Dogugaeshi – a beautiful non-figurative visual montage, drawing on the Japanese tradition of using decorated screens to perform interludes between puppet shows; and then Scottish company Knights of the Invisible’s Black Regent – an improbable and mesmerising fusion of synth-y noise music and expressionistic dance; finally, there was the Italian company Città Di Ebla’s adaptation of James Joyce’s The Dead – an elegantly minimalist production that blurred tableaux and projection, with a screen foregrounding the set so that the two bled into one another like a double exposure. All of these shows developed entirely new ways of communicating with sound and image – revising traditions, creating fusions and devising original forms of visual presentation. Experiments like these should be of just as much interest to people making text-based work as they are to those invested in visual theatre. This year’s festival has been no less exciting. Highlights for me were French company Stereoptik’s Dark Circus, which combined real-time illustration, animation and object manipulation to create live film; Compagnie Yoann Bourgeois’s He Who Falls – another French company fusing dance with engineering, this time using a moving platform and six performers to create electric rhythms; and the Dutch Jakop Ahlbom Company’s Horror – a dance-based homage to the movie genre; deeply weird and imaginative. It was also great seeing new work by UK-based performers – including Al Seed, Trygve Wakenshaw and The Wrong Crowd. The latter’s Kite was a lesson in how to communicate an emotionally charged and relatively plot heavy narrative with simple imagery and committed performance. It would be wrong to suggest that the festival is exclusively experimental in nature. There are some more traditional shows: mask companies like the German-based Familie Flöz and the UK’s own Vamos; clown acts like Thomas Monckton and Jos Houben; and puppetry from companies like Figurentheater Tübingen and the UK-based Faulty Optic. Formally, the approaches of companies and individuals like this are more conventional – offering something close to what you would expect from a mask, clown or puppet show. But even then – to call them traditional is a little unfair: much of their work is just as weird and just as challenging as the work of others who are more expressly exploring new avenues of visual storytelling. Even accounting for the possible exceptions, it’s obvious that the festival is one of the most prominent wings of our theatrical avant-garde (different but equal to the work of practitioners like Tim Crouch, Made in China, Forced Entertainment, Ontroerend Goed, Kim Noble – and the many others making boldly experimental work in this country). I believe quite strongly that the purpose of such work should be to lead the way, not to exist separately. At the very least, work that is as visceral and inventive as this indicates new possible directions for an art form that is threatened by online media and film – which among other things have sharpened audiences’ visual awareness and heightened expectations. But it’s not just that work like this better caters to the demands of modern audiences fed on visual media – it’s also that it seems to be braver, and to have more attitude. I can’t help but feel that if Beckett were alive now – he’d be more interested in the work of C111, Hiroaki Umeda and Knights of the Invisible than in even the boldest programming we get from UK theatres. Supposedly, the division between visual forms of theatre and more conventional work is fading. 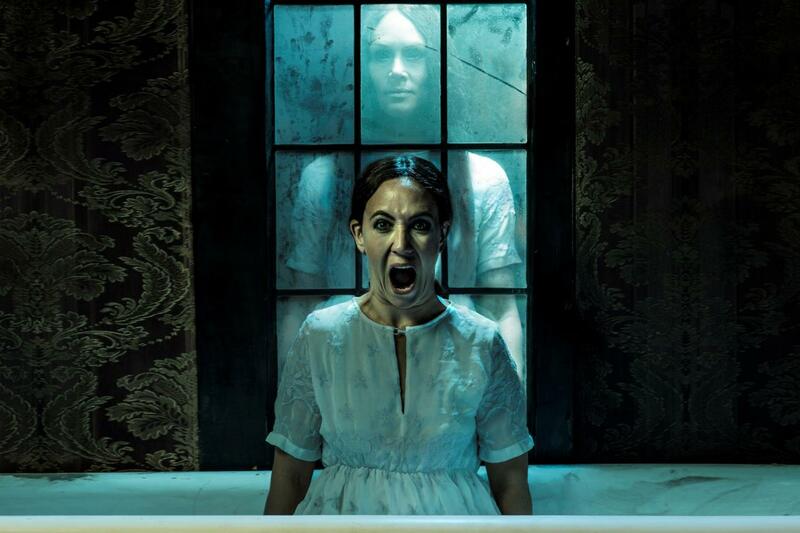 DV8 can now be seen at the National, Emma Rice is running the Globe, and Shunt, Punchdrunk and Gecko are among some of the most respected companies operating in the UK. We continue to experience the gradual erosion of the conservative dogma that plays are primarily a textual and aural experience. Audiences and critics are more excited now than they ever have been by the visual experimentation of so-called auteur directors like Thomas Ostermeier, Simon Stone and Katie Mitchell, whose shows often look like they could have been made by Robert Wilson or the Wooster Group. In terms of UK based directors – people like Richard Jones, Lindsay Turner and Polly Findlay are increasingly creating shows that are operatic in feel: driven by abstract imagistic concepts in a way that even ten years ago you wouldn’t have expected to see at the RSC, the National or the Old Vic. And yet visual theatre is still regarded by a lot of people as something separate and inferior. It seems to me that the mime festival is an excellent way of remedying that. 2017 is the LIMF’s 40th anniversary, and it’s bound to be bigger and better than ever. Here’s hoping that it continues to grow and that it can be seen by those who dismiss it for what it is – not a clown festival for pesky kids, but a brave exploration of visuality and live performance, pushing at the outer edges of communicative possibility with a body of work that is as diverse and daring as it is strange.